Mild, soft, fresh goat's cheese, one of the few cheeses produced in Morocco, is used for this salad. If you are not keen on raw garlic, you can leave that out. Place the peppers on a sheet of foil on an oven tray under a preheated grill, 6cm-9cm from the grill. Turn them until their skins are black and blistered all over. Alternatively (and more easily), you could roast them in the hottest possible oven for about 30 minutes or until they are soft and their skins blistered and blackened, turning them once after 15 minutes. To loosen the skins further, put the peppers in a freezer bag, twist it shut and leave for 10-15 minutes. When they are cool enough to handle, peel and remove stalks and seeds. Cut them into thin ribbons. Dress the chickpeas with a mixture of 3 tbsp olive oil, the lemon juice, salt and pepper, 1 crushed garlic clove, and 1/3 of the oregano. Add to the peppers and mix well. Mash the goat's cheese with the other garlic clove, the last tbsp of olive oil and the remaining oregano, and shape into a mound on a serving plate. 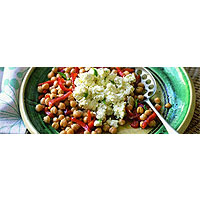 Arrange the chickpeas and peppers around it.